Knit, Lola, Knit: Look who I found! I'm joining Team Alaska for the Knitting Olympics! I know, I'm not in Alaska anymore, but as they say "you can take the girl out of Alaska but you can't take Alaska out of the girl", right? Well it's something like that. Besides, no one's started Team Utah. I don't think people in Utah even know about the Knitting Olympics, other than the people I've told and they just look at me weird. It's ok, I'm used to it. I thought about joining Team Knitting in Public too, because I'll be doing a lot of that, but Alaska has my allegiance! In other randomness, I think I've got my pattern all planned out. I'm a little worried about the increases for the scoop neck, but I guess I'll just have to do it and see how it looks. I think I'm going to call this my Red Hot Hipster Sweater. It's red, hopefully it'll be hott and it's going to be a hipster/tunic length, so there you go. Oh, goodness, I hope I'm not setting myself up for disaster! I'm getting nervous! 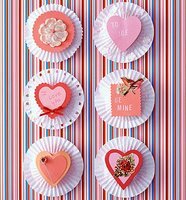 Also, in anticipation for V-Day next week (no, not that V-Day, Valentines...) Martha Stewart of course always has the cutest ideas. 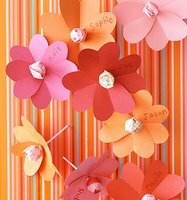 How easy and sweet are these? Now, if only I had the time, or someone to make them for! I certainly have all the supplies, so maybe I'll find the time. Who wouldn't love one? I'm kathy in Juneau -- Your Team Alaska Teammate!! Just thought I'd visit you at your blog. Your swatch looks great. See you at the starting gate tomorrow! Hi, just thought I'd let you know, I started a Team Utah yesterday. There is a link to the blog on my blog, its just me so far though - lol. There is also a Utah webring, the link is also on my blog if you're interested. Have fun with the Olympics and good luck! I've always wanted to know someone who was in the Olympics. Awesome!